Simon’s love of books seems to be increasing at a rate proportionate to his understanding of them. A favorite for many months now, they are now nearly always his first pick of toys. Watching him “read” them is funny and inspiring at the same time. His normal routine is to pick the book up, turn each page one by one, then flip the book over and start from the beginning. He’ll repeat this many times in a row, each time carefully holding down a page with his left thumb while his right forefinger sits on the top right corner of a page, poised to turn it. I’ve never seen him turn pages backwards. For the past week or so, he won’t read books upside down, either. If handed a book this way, he rotates it until it is right side up, then begins his page flipping. On many pages, he’ll point to one or more objects that catches his eye. His reading is frequently accompanied by babbling. I am surprised at how much Simon understands about books. Because he sat up but couldn’t locomote for nearly six months, I had the idea his development was stalled. 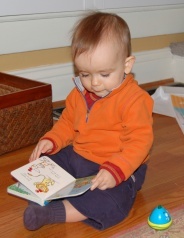 Clearly, that was not the case, as his book reading demonstrates enormous leaps in fine motor skills and cognition. And as with his discovery of the sky, fresh air, grass, leaves, and trees, this interest makes me regard books with a bit of refreshed wonder myself. How amazing is it, after all, that pictures and ideas can be captured between covers to revisit whenever we’d like?